Adapted from the Breakfast of Champions column in the Saturday Guardian magazine. I loved the look of these prima ballerina's favourite breakfast muffins, but wanted to make them gluten free... and decrease the sugar load by quite a bit. 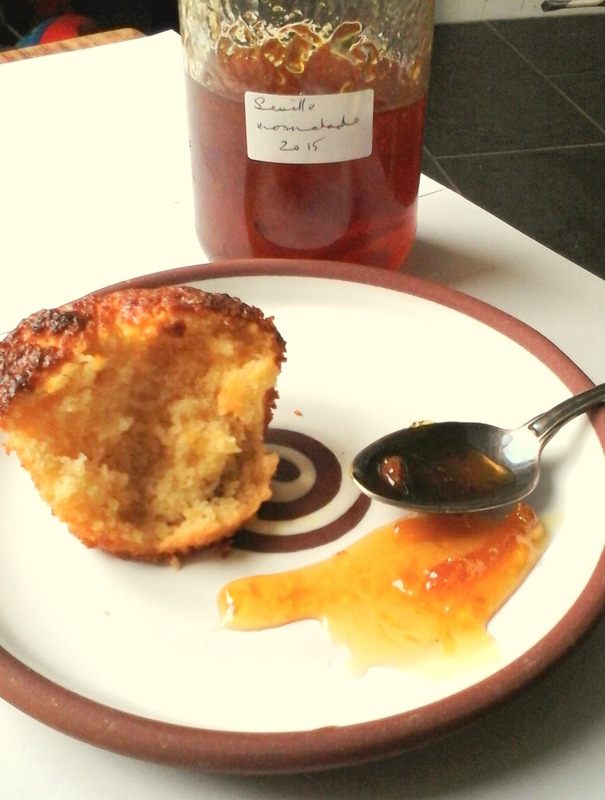 They are light and fluffy, more cupcake than muffin texture, with a rich, tangy marmalade flavour. Paddington would most definintely approve! Heat the oven to 170C fan and put muffin cases in 9 holes of a 12-hole muffin tray. Combine the dry ingredients, crumbling them together with your fingers, getting rid of any lumps. Briefly whisk the wet ingredients together to combine, pour into the dry along with the marmalade, and mix briefly by hand until just combined (over-mixing makes for tough, dense muffins). Fill the cases two-thirds full, and bake for 15-20 minutes until a tooth pick comes out clean. These are DIVINE warm... they are quite grainy and dry the next day.